""It's like any other muscle if you don't use it, it atrophies""
Could this be a comic fan's absolute dream? Or in Illyria or Liandra's case a nightmare? If fan service was the catalyst here, then it sure as delivered. But it could only really be one of two things, as Peter David had this idea for a while now, only now we get to finally read it. How is this possible you may ask? 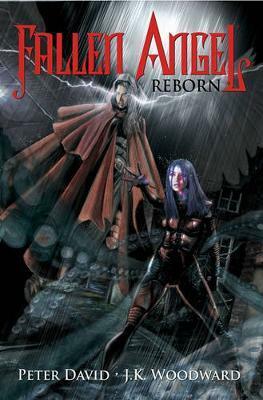 Peter David personally got permission from Joss Whedon himself if he could feature Illyria in his upcoming arc of Fallen Angel. There are no clashes with the timeline from either title. Infact you almost don't need to have a backstory on Illyria or Fallen Angel to understand most of it. This arc takes place during Season 5 of Angel after Illyria was depowered of most of her strength, invulnerability, teleportation, time manipulation and plant telepathy abilities in the episode Time Bomb, but before The Girl in Question. The first few issues are set where Liandra is based, Bete Noire, the city that shapes the world that Illyria visits. It is a self contained city where time passes much slower than the rest of the world. But if Illyria can retain her former glory, that means she can go anywhere in time or alter it anyway. This Illyria/Fallen Angel crossover manages to give a fresh character insight for Illyria's bac­kstory, without it being redundant. Illyria seems to blend in well in Liandra's world and Bête Noir. Maybe even more than she does in LA with Team Angel. Despite being opposites, a former demon god-to-a-god like Illyria and Liandra a former divine being, have an unlikely understanding somewhat due to their experiences with rise and falls. These parallels however make for some entertaining antagonistic chemistry. But as intriguing as the hostility between these two can be, it's the lighter moments such as Liandra's self-analysis of having an atrophied heart that are subtle highlights. Illyria and Liandra are almost like a female Angel and Spike duo, with Liandra with her snarkiness making her lean more towards Spike. 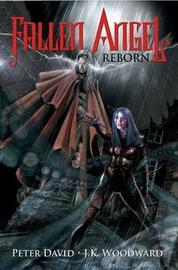 * In this all-new collection, the Fallen Angel finds herself pitted against a special guest-star...Joss Whedon's Illyria! On a mission to reclaim three objects of power which she hopes will restore her former glory, Illyria must also dispatch of another "fallen" godling, namely Liandra, the Fallen Angel, Magistrate, and protector of Bete Noire. Peter David is a prolific author whose career, and continued popularity, spans nearly two decades. He has worked in every conceivable media: Television, film, books (fiction, non-fiction and audio), short stories, and comic books, and acquired followings in all of them. Peter has had multiple New York Times Bestsellers, and has written legendary runs of The Incredible Hulk, Aquaman, Supergirl, Spider-Man 2099, Star Trek, and X-Factor.